SHE’S THE ULTIMATE WEAPON IN FIGHTING DESTINY. 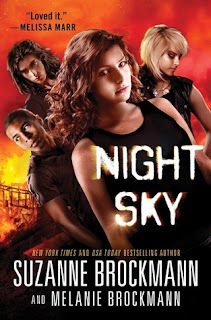 New York Times and USA Today bestselling author Suzanne Brockmann and her daughter Melanie Brockmann have written a pulse-pounding novel of paranormal suspense set in a near future both fantastic and frightening. I was a little nervous about this one when I got the email blast from Sourcefire to have the opporunity to review this one. It is called a "paranormal suspense" but I would say it leans more towards science fiction, so don't let that fool you into thinking this book isn't for you. It was actually a lot better than I was anticipating because it didn't have all the elements of your typical "Girl Finds Out She Has Superpowers" type deal. I really liked Skylar. I thought she was pretty cool -- the type of person I'd want to be friends with if they were real. She took her responsibilities seriously and wanted to do the right thing by Sasha and her family. I liked that Skylar saw Sasha almost as a little sister. I also liked that she was JUST friends with Calvin. I liked that their relationship wasn't defined by them wanting each other but not doing anything about it. While I do think Calvin has feelings for Skylar, she just sees him as a brother-type individual. This was SO REFRESHING. Actually, Calvin's character in general was refreshing: a disabled, poc character who was right in the mix of things. Skylar was always adamant about him coming along, whether it be to the training sessions or to the thick of the fighting. I was just in awe of this while reading. It definitely made the story a whole lot better in my opinion. I also really liked the female friendship in this one between Dana and Skylar. Yes, Dana was weary of having to train Skylar at the beginning, but I think that had to do more with Dana and her quest to stop those that are making Destiny rather than not wanting to be friends with Skylar. And the whole fact that Dana reached out to Skylar, when she definitely did not have to, makes it even better to me. I also liked that even though Skylar was falling for Milo, she was worried about what it would mean for her and Dana. She put her friendship with Dana above her romance with Milo and that is so important. Like yes, let's teach more people that it is WAY more important to have good friends than to have a boyfriend. One thing I didn't like was that I found Skylar used her powers a lot in front of random people even though she was specifically warned against this. Of course, nothing really came of it (yet) but I feel like she should have been more cautious and weary of using her powers. I did think there was good pacing for the plot and the characters were well developed. I thought that there could have been a bit more emphasis on the training piece before the final showdown. 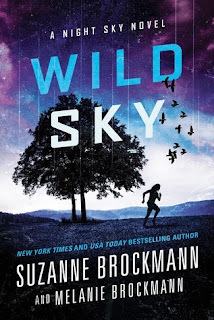 I'm also not quite sure where the plot can go from here, but I am really excited to continue reading (thankfully I can because I have an ARC of Wild Sky). So I dove right into this one after I finished Night Sky because I really enjoyed that one and was interested to see where it would go. But just like I wrote in my review of Night Sky, I wasn't sure where the story would go and it almost seemed like Wild Sky didn't have clear direction in my opinion. It really didn't have a place that it could go and really kind of feel into the "Second Book Syndrome". I thought that Skylar and Dana were still awesome and still had a great friendship. I liked that they started to rely on each other more throughout this one. And that Skylar's training was still on going because she wasn't PERFECT yet. Which is something awesome. Those were all the good parts. And I liked that Skylar and Milo learned to trust one another, since they kind of had a bit of instalove in the last one. But I thought that Skylar was a little dense that she didn't realize that Milo had been abused. It was HEAVILY implied in the last book and in the beginning of this one. I am not sure how I feel about the whole Calvin thing though. I feel like it was just a weird plot device to make his heart better and tell us that there are ways to cure the D-addicts. But honestly, it felt weird and squished in there. It was really awkwardly done, in my opinion. I think maybe it would have been better had there been more said about it or if there was more time spent on it. It felt really rushed. I think it was pretty real to have Calvin want to be able to walk again but I still felt a little weird about a sort of "miracle cure" in this story. And what was with the ending?? It didn't feel like an actual ending. I want to know more about these cells rather than Lacey and her wanting Milo. It was strange to me. Why is it more about the romance than the SUPERHERO GIRLS. I am not sure what to make of that. But it was still awesome and I loved every second of it. I cannot wait to see where this goes.